Here is a live Commento demo that allows potential new users to interact with the interface. Now that we know what features Commento has in common with other platforms, what does it do differently? 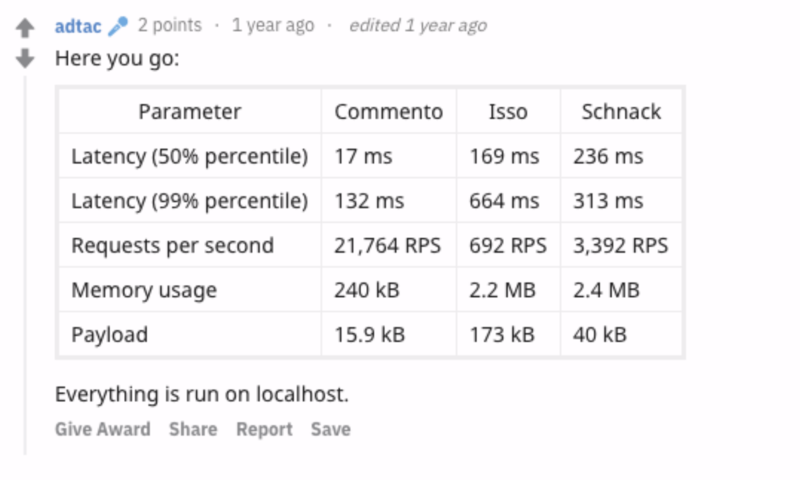 Commento is lighter and faster than pretty much any comparable platform. Every embedded Disqus frame makes about 90 network requests, injecting so many third-party tracking scripts. Facebook comments is equally worse with 1.5+ MB of data download. This thread was made on November 27, 2017. Since then, adtac has succeeded in reducing download to just 11 kB and isn’t done yet. What About Other Open Source Options? Even compared to other open source Disqus alternatives, such as Isso and Schnack, Commento is much faster and requires less download data and RAM. Although many platforms rely on advertisements and selling personal to make revenue, Commento does not. Commento operates under the belief that once your private information is released, there is no way to undo this. Because of that, it is important to begin prioritizing privacy and safety before it becomes an issue. Because Commento is free and open-source, anyone can download the software from and host it on their own server. This can be a great option for people who are familiar with basic coding and server upkeep. There is also a paid version of Commento which has very flexible payment options. People who purchase the service will have server hosting, updates, and security all taken care of for them. This is perfect for people that do not have the expertise or time to manage the server themselves. All plans (paid and self-hosted) have the same features included. Larger and more corporate services like Disqus typically have basic plans which are completely free and in which they host it on their servers. Why then, does Commento charge for theirs? adtac has explained that because servers take money to host and maintain, it is not sustainable to offer this service completely for free. Platforms like Disqus can afford to offer basic plans for free because they are making money from advertisements regardless. Again, Commento does not run ads or sell user info, so a small subscription fee is required to cover basic costs. Depending on your personal views, paying $5 per month for the hosted service could be very worth it, considering the better speed, increased privacy, and knowledge that you are supporting open source software.